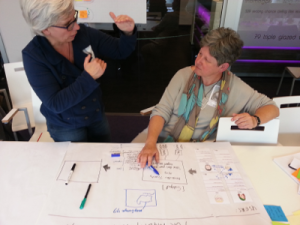 From Platoniq and other partners we are developing a methodology and set of activities for co-creation workshops related to the Europeana Creative challenges. The themes of these challenges are natural history education, history education, tourism, social networks and design. 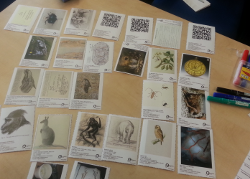 The workshop activities promote the re-use of Europeana-related content in new digital applications. The activities take participants through a series of actions they can take when designing digital projects and software applications collaboratively. 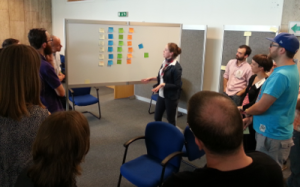 The workshops take them from idea generation to initial wire-framings and development planning following the Agile project management principles. The methodologies try to guide participants, conducted by a facilitator, from scenario planning to collective decision-making, definition of personas and their relation to cultural objects, and finally to group design and visual definition of ideas. In this first version of the methodology, each activity is described individually, with the recommended duration, materials needed, goals and instructions. We recommend that each workshop starts with a programme of short presentations (5 to 10 minutes) that outline the technical possibilities, areas of interest and available content. This helps everyone to understand the context of the task. Finally, the workshop should reflect on the results and outputs of the activities and create a “backlogs” list that will outline the next steps and tasks. As a project under development, the activities described in the document can be considered as a work-in-progress, since they are still being adapted and tested. Partners’ experiences in the first two co-creation workshops designed around the natural history education and history education themes, for example, are influencing the shape and format of the next co-creation workshops on the tourism and social networks themes. However, the current version could already be adapted for other incubation processes and spaces such as digital labs.